Global mHealth apps market expected to generate around USD 111.1 billion by 2025, at a CAGR of around 38.26% between 2019 and 2025. The growing adoption of mHealth apps for tracking health and vital signs is likely to drive the mHealth apps market in the years ahead. The report covers a forecast and an analysis of the mHealth apps market on a global and regional level. The study provides historical data for 2016, 2017, and 2018 along with a forecast from 2019 to 2025 based on revenue (USD Billion). The study includes drivers and restraints for the mHealth apps market along with the impact they have on the demand over the forecast period. Additionally, the report includes the study of opportunities available in the mHealth Apps market on a global and regional level. In order to give the users of this report a comprehensive view of the mHealth Apps market, we have included a competitive landscape and an analysis of Porter’s Five Forces model of the market. The study encompasses a market attractiveness analysis, wherein all the segments are benchmarked based on their market size, growth rate, and general attractiveness. The report provides company market share analysis to give a broader overview of the key market players. In addition, the report also covers key strategic developments of the market including acquisitions & mergers, new product launch, agreements, partnerships, collaborations & joint ventures, research & development, and regional expansion of major participants involved in the mHealth Apps market on a global and regional basis. The global mHealth apps market is segmented based on type and region. Based on the type, the market is segmented into healthcare apps and medical apps. Healthcare apps segment held the largest market share in 2017. Healthcare applications include chronic care management apps, medication management apps, general health and fitness applications, personal health record (PHR) apps, women’s health apps, and others (dermatological treatment, sleep monitoring, and emergency response (vital tracking)). General health and fitness apps include weight and obesity management apps, health-tracking apps, and fitness and nutrition apps. Chronic care management apps include diabetes management apps, behavioral disorder, and mental health management apps, cancer therapy management apps, blood pressure & ECG monitoring apps, and others (kidney disorders, respiratory diseases, and infections management apps). Women’s health apps are further classified into fertility apps, breastfeeding apps, pregnancy apps, and others (apps for sleep, activity, and stress level tracking). Medical apps are made for medical professionals and are classified into continuing medical education apps, consulting & communication apps, medical reference apps, and patient management & monitoring apps. The regional segmentation includes the current and forecast demand for North America, Europe, Asia Pacific, Latin America, and the Middle East and Africa with its further segmentation into major countries including the U.S., Canada, Germany, France, UK, China, Japan, India, and Brazil. 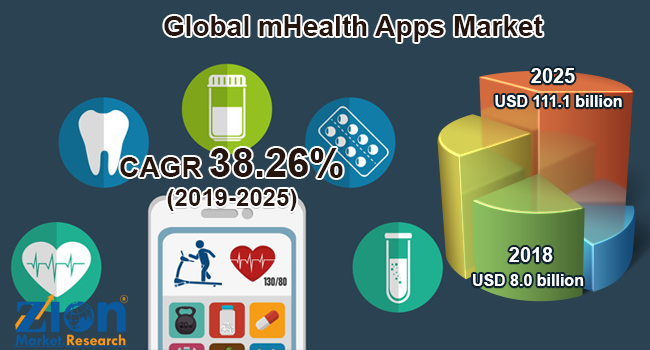 Some key players of the global mHealth Apps market include Johnson & Johnson, Abbott Laboratories, AstraZeneca, Novartis AG, F. Hoffmann-La Roche AG, Bristol-Myers Squibb Company, Merck and Co., Inc., Pfizer, GlaxoSmithKline plc, and Sanofi, among others.